Hello! I am looking to set up a planted Mr.Aqua 12 gallon long tank. It is going to be situated in front of a large window. I will be keeping close watch on the temperature as well as managing the algae growth. However, I would like some suggestions with the overall tank set-up. The Squirmy Things: I plan to have cherry shrimp, 2-3 African Dwarf Frogs, and either a few small ottos/algae eaters whichever will get the job done. Filter: I have purchased and AquaClear 20G filter, as it uses a block filter which I love(I will also consider a better block filter if suggested. No canisters though ]: ). It also has good reviews. However, reading on forums months back(when I bought the tank), flow was an issue for many people. Most opted for a spray bar. Instead, I picked up two 10" TopFin Bubble Wall thin tubes that situate themselves along the bottom of the tank. So the air bubbles are traveling up and instead of the water dropping like a waterfall into the tank. Is this effectively the same thing? Or will this cause too much disturbance for the inhabitants and I should go with a spray bar instead? I haven't set anything up so I'm not entirely sure how strong these bars are, but they're very narrow. Should I be placing this HOB filter on the side of the tank or the long back? I'm assuming with a spray bar the filter would need to be placed on the side. Plants: Going for an Iwagumi style(grassy, rocks, natural landscape). Optimally I would love to grow a dwarf hair grass carpet, or cuba moss carpet but I've never had luck with either in previous tanks. However, I didn't have the greatest lighting set-up before (Fluval Edge 6G) so that may be why. I was also periodically dosing the plants with Flourish but then found out it wasn't healthy for the particular species I was keeping- so I stopped. Aside from that what other plants would be good? They can't be crazy growers and preferably something the algae eaters(whatever they may be) will particularly like, along with the shrimp and frogs. Lid: I searched for a lid for this tank but seeing as it's meant as an open top tank, there isn't one. So, alas, I shall make my own. This is because my roommate has some adventurous one year old kittens. Adorable. But evil. So, I'm thinking of getting an aluminum screen protector(basically aluminum mesh) because the kittens will likely rip the soft mesh stuff. A half-inch rim made of wood and have it grooved in the center all sides, so the lid sits snugly onto the rim of the tank so the cats can't knock it off. However, I'm open for other suggestions as I'm truly not sure what is best. I don't want something suuuuper chunky and distracting looking. I believe that's all. Please add any additional issues I may have missed and any suggestions. Thank you so much! I am going to be a bit of a party-killer. When I had dwarf African frogs in the past, they ate every young fish they could fit in their wide little mouths. I wouldn't want to be a shrimp in there. Then again, I have never kept shrimp and frogs together. The latter are predatory though. A tank in direct window sunlight is going to be a daily work routine to keep from algae. It won't just be on the glass, but probably also on the grassy plants, or moss. You would have a serious chance of algae over-running everything in there. It may also have temperature regulation problems in the heat of summer, and even more in the cold days of winter. Aquarium heaters are notoriously unreliable - they are very cheaply made. Cats will get on top of the tank, so whatever you put has to be able to support their weight. I have seen cats IN planted aquariums, swimming underwater before launching themselves all over an apartment. Yeah... I confess, I laughed, as it was a pretty spectacular sight. Then the cleanup started. I don't understand how you are using the aquaclear. My understanding is that it has a wide outflow. How would a spray bar, or any other device be connected to that? I can't visualize any possible attachment. The AQ filter dissipates the force of the flow along the drop, and would not have any force even if you built a complicated system to get the water to the spray bar. So I think you need to reconsider artificial light and get more hands on advice about frogs and shrimp. As well, I can't see the filter plan. I honestly never thought about how the filter would connect to the spray bar. I figured there was some method for it. I've had African dwarf frogs in the past. They're so clumbsy and blind that id have to stick blood worms right in front so that they could even see them. So I didnt see any issue with them eating shrimp since their mouths are small. What would be a good option to get flow throughout the tank? My logic is that with so many algae eaters in the tank, and weekly cleaning, the algae will keep in check. I would also close the blinds of ai notice anything going out of whack. Yeah the cover is going to be tricky to figure out. Luckily..cats aren't too heavy. Hello @R00kwook welcome to Canadaquaria! I have also used AC filters, and they are definitely good stuff. I have an AC30 along with a Fluval C3 running on my 26 gallon tank. The one thing I might suggest long term would be upping the filtration a little bit. While they are advertised for a certain range (for instance the AC20 is rated from 5 to 20 gallons), it is really a bare minimum. If you are running air lines into the tank, you could consider a simple and easy sponge filter in addition to it. I too would caution the African dwarf frogs too. I have seen some unfortunate cases where they managed to even latch on to guppy/tetras that were not paying attention. Most will certainly try to fit anything in their mouth that they can, perhaps not actively, but in the long run I'd be a bit cautious. I would be especially wary of keeping cherry shrimp with them, as they are very small and can very easily fall victim to a lot of occupants. 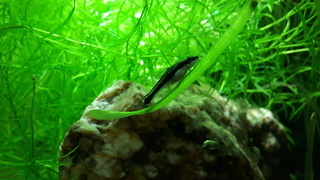 Something a bit larger (like amano shrimp) might be an option. As for "algae eaters" I'd make a few suggestions. First of all, a little it of algae in a tank is totally normal/natural. There is definitely established belief among a huge amount of aquarists that having something to eat or "control" the algae. This isn't really the case, ultimately controlling algae will need to come from a balance of water chemistry, light, nutrients, and other plants in the tank. If you have the right balance (especially of light and nutrients) algae is generally quite easy to keep in check. 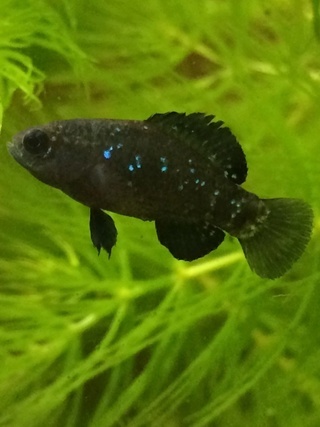 A lot of fish that are sold as "algae eaters" are actually not that proficient at eating algae, or will only seek it out if there is absolutely nothing else to eat (and then only very specific types of algae). That being said, I do also like have a bit of a "clean up" crew that can help with algae a bit (but not without the correct balance of the tank). You had mentioned otos, and that's definitely an option. They are a cute peaceful fish, that is best kept in small groups, as they are quite social. They'll feed on certain algaes, but if your tank is balanced, they will never keep up (nothing will). My other suggestion would be amano shrimp. 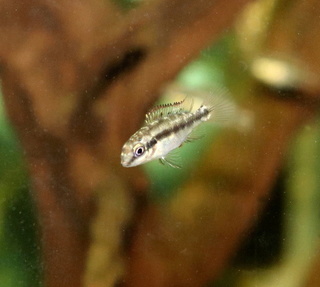 I love keeping them in a planted tank, and they are for their size, the absolute most efficient at eating algae. They have a two pronged benefit, not only will they munch on a variety of algae throughout the day, but they will also spend a lot of time picking through the substrate grabbing any leftover bits of food etc. Not having any extra food decaying in the tank will certainly help from some algaes from even forming. Again, with all of what I've mentioned, even an army of amano shrimp cannot adequately control algae if the conditions of the tank are optimal. Long post, but welcome again! Perhaps consider stopping by the intro section and saying hello. I hope you'll keep us updated with your tank as you go. Consider stopping by our tank journal section, and consider starting one. They are great to track the progress of your tank, ask questions, and show it all off. Glad to have you aboard! Thank your for your welcome and reply. I plan on making a tank journal. Would it be a better idea to get an AC rates for 30+ gallons instead? I assume id still have a flow issue since the tank is so long. I just don't want massive current going on for the shrimp. It seems the frogs are put even though I would love to have them. Red cherries, amanos(how many), Ottos(how many for a group?) and no frogs. What would be a way to get flow throughout the tank? Can I just use those bubble bars I mentioned? And should I position those near the water line or at the bottom of the tank? I forgot to welcome you! I would put the AQ to work as is. You will have plenty of flow. The wide exit on the AQ spreads the flow out and makes it less concentrated and turbulent than the narrow exit on a canister would. For the creatures you are planning, it should be a perfect choice. The water will easily move throughout the tank. Otos are river fish, so they will like a little current. I'm still concerned about that sunlight. I keep rainbowfish, and I know of no other group that worships sun like they do. I have tried many tank placements to give them their sun (and give me the show they put on when morning sun hits them). Even angled away from the light, algae in those tanks is an issue. No algae eater eats all the algae. I have thriving Ancistrus busy in one of my window edge tanks, but they are very choosy in which algae they eat. Likewise when I kept Otos. Algae on the glass is not a problem - 2 minutes' and it's gone. But in the plants and on the decor, it can be a pain. I say that as someone who considers a tank without algae to be a failure as a habitat. I dislike sterile, algae free aquascapes as to me, it just means they are new and not ready for life to thrive in them. It's a hobby of trying things. We all have unique edges in the conditions we offer, and maybe that will work out. But the filter's a solid choice, whether it is on the end or at the back. It will work both ways. Hmm so the final issue will be figuring out the sunlight. I'm assuming keeping the window covered the majority of the time would prevent too much build up. If I'm going to plant HC Cuba as a carpet, is it a lack of sunlight or cO2 that leads to its demise? Because I really would like to avoid a cO2 setup. Sorry if this is not to helpful, im still new. 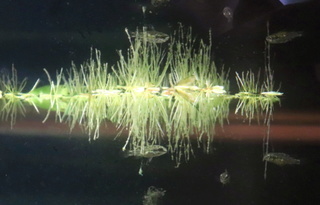 I was having the newbie brown algae issue, its on my glass and plants. Used to have a mystery snail but he ate my plants. Got 3 nerite snails and its nearly all gone. They clear it from the plants, rocks, decorations and everything without eating any plants. Mabye worth a look? Seems they go for algae first in my experience.